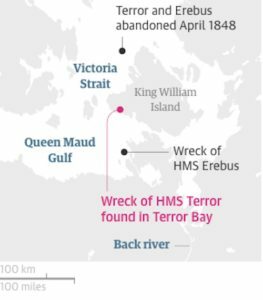 Getting to Antarctic back then “was very difficult indeed,” and they had very little information about the route – “if any at all”. In 1989 Arved Fuchs skied to both Poles. 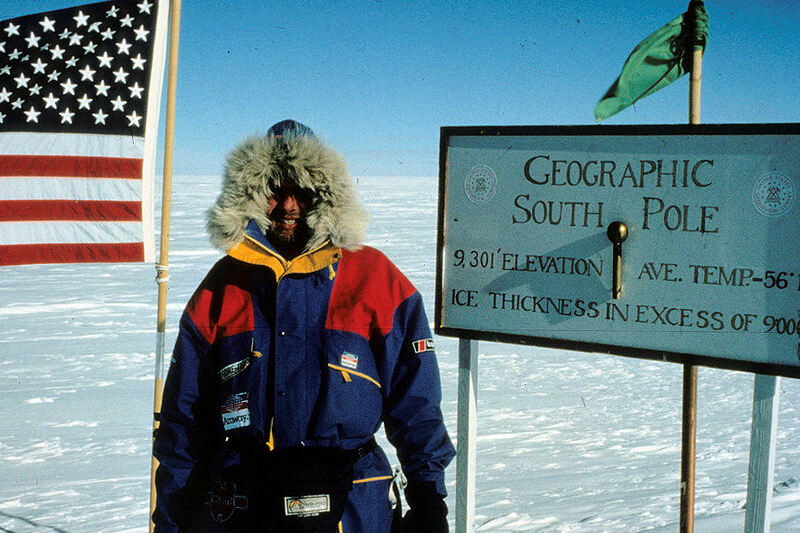 First to the North Pole and then to the South Pole, which he traversed with teammate, Reinhold Messner, to Scott Base, a distance of 2800km in a straight line. These two expeditions marked the end of the era of conventional navigation with sextants, however, explained Arved to Explorersweb, the GPS system he used was still not operational or reliable on Antarctica. Fuchs was the expedition’s navigator, all the way. At that stage, Messner had climbed extensively in the Alps, climbed Everest twice, and had completed the Seven Summits, which he calls in his book, Antarctica Both Heaven and Hell, a “childish game”, which “impressed the media public.” After Mount Vinson, he looked for someone to team-up with on an Antarctica traverse. He wanted someone who was not a mountaineer, but a specialist in ice travel, and also a navigator and radio operator, he writes in his book. Fuchs was a skilled seaman, thirty-five years old, and had extreme trips under his belt, Messner adds, and he met the mentioned requirements. Fuchs, among other expeditions, had bagged the North Pole and then wanted to turn his compass South. “We both wanted to do this expedition, and we both were looking for a suitable partner,” he told Explorersweb/Pythom. Still and active seaman today, we caught up with Arved. He tells about how (in)accessible Antarctica was (without Ilyushins, Boeings, satellite images, satellite phones…), how he had to make his own sled, how dangerous the heavily crevassed descend was to the Ross Ice Shelf, and more. Explorersweb/Pythom: 1989 is quite a long time ago, how easy/difficult was it to get to Antarctica? Arved Fuchs: It was very difficult indeed. The only way to get to Antarctica was with Adventure Network that was operating a very old DC 6 out of Punta Arenas, which broke down all the time. It really was a nightmare because we were nearly running out of time. We were delayed by 8 or 9 days and getting to Antarctica was probably the most dangerous part of the whole expedition. Starting point was Punta Arenas and we landed at Patriot Hills. About your start point on the ice, we heard that you actually wanted to start at Berkner Island. What happened that you were dropped at 82°05’S, 071°58,5’W? Arved: Since the DC 6 was in such a bad shape ANI was not able to bring in enough fuel for the Twin Otter which was supposed to take us to Berkner Island. So either we had the option to start from Patriot Hills or at least at the edge of the continent from the place I mentioned to you. Due to fuel shortage, Berkner Island was no option. No one has done that route to the South Pole before. What did you know about the route? You first had to go west, right? How did you navigate? Arved: We had very little information about the route – if any at all. I had made a plotting sheet at home where I marked our daily position. Navigation was still by sextant, artificial horizon but mainly by compass. We also had a so called, hodometer, which was basically a bicycle wheel with a meter measuring the distance. We were also carrying the first prototype of portable GPS receiver. However, in 1989 the system was still not operational or reliable all the time. Some days it was even shut down completely, during other days you had to be lucky to get a position. So since I was the navigator I didn’t dare to rely on GPS only. What communication did you have with the outside world and with ANI? Arved: Communication in those days was complicated as well. On the way to the South Pole we had a HF radio (Spillsbury) but it was too weak. So we left it behind at the Pole. We had an Argos satellite transmitter which would relay our position to France. So the outside world would know where we were, but we didn’t get any reply, neither could we communicate with the outside world. Sleds: I made them myself. Same type I used for the North Pole Expedition. Made out of kevlar and carbon. You couldn’t buy anything like that in 1989. Clothes: Goretex, I used Berghaus equipment, Reinhold used Fila. Boots: Asolo leather boots. These caused a lot of problems. Since I have rather large feet, they lost their shape after a while and caused some serious blistering. Sails: we had two different sizes. I believe 8 and 12 qm. They were not like the modern kites, they were more like small parachutes. With the traverse, which glacier did you take down to the Ross Ice Shelf? Arved: We came down the Mill Glacier which eventually leads into the Beardmore. The Mill was very icy but otherwise good. The problems started were the Mill enters the Beardmore. It was very heavily crevassed. We had to cross the whole of the Beardmore, which took quite it bit of time and which was a dangerous route. What were the three most challenging moments during the expedition? Arved: I think crossing the Beardmore was the most difficult part. The sastrugi on the plateau gave us a hard time as well. And then of course the distance. You must not hurt yourself because there was no way for us to be airlifted out. How did you get off the continent from Scott Base? Arved: We were invited by the Italian base in Terra Nova Bay. We flew by helicopter from Scott Base to Terra Nova and from there sailed with a supply vessel (Barken) back to Christchurch. You were an experienced Polar skier and Mr. Messner an experienced mountaineer. How did it come that you two teamed up? How was it to do an expedition with him? Arved: We are quite different personalities and had a totally different background. We also didn’t know each other before. We both wanted to do this expedition, however, and we both were looking for a suitable partner. So that’s why we teaming up – and we were successful. Arved: Compared to the North Pole expedition, which I did the very same year, it seemed to be much easier, although it was a long haul (92 days). Arved Fuchs: born April 26,1953. In 1989 the German skied to both Poles. First to the North Pole and then to the South Pole. He became the first person to ski to both Poles in one year. 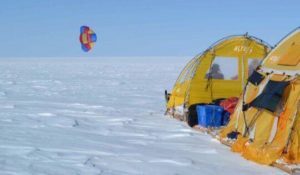 Arved and the team departed from Cape Aldrich on Ellesmere Island and reached the North Pole on May 14th after 56 days on the ice. End of the year, he and Reinhold Messner reached the South Pole from the Ronne-Filchner Ice Shelf, and traversed to Scott Base, a total of 92 days. Apart from skiing to the Poles, Arved crossed Greenland with dogs, dog-sledged Northern parts of Ellesmere, and did a ski expedition and first ascents on the Southern Patagonia Ice Cap. He also has many accomplishments on the Oceans: rounded Cape Horn in Winter with kayak, first, and to this day, only winter rounding by kayak there, according to his website. He had done many sailing expeditions in the Arctic where his ship had overwintered in the pack ice many times. Northwest Passage. Northeast Passage. Franz Josef Land. In 2000 he completed, together with three companions, the first total repetition of the Shackleton Expedition in the Antarctic – starting from the Antarctic Peninsula, they sailed in an exact replica of Shackleton’s rescue ship the “James Caird”, to Elephant Island, and then on to South Georgia – a distance of altogether 1800 kilometers. Following that, they crossed the alpine mountains of South Georgia to Stromness. Mr Fuchs has written 18 books. Read more about his past and current expeditions on his website. Reinhold Messner: born September 17, 1944. The Italian, with Peter Habeler, became the first to summit Everest without supplementary oxygen. In 1980 Messner was the first to solo climb the North Face of Everest. 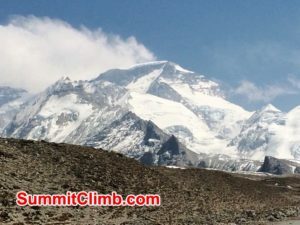 He also completed the summits on all 14 8000 meter peaks. Explorers House for a map with interactive South Pole ski routes. Note: The Messner route has now been renamed the “Fuchs-Messner” route. Messner had a higher name recognition, but Fuchs had more polar experience and deserves to be on the route name.